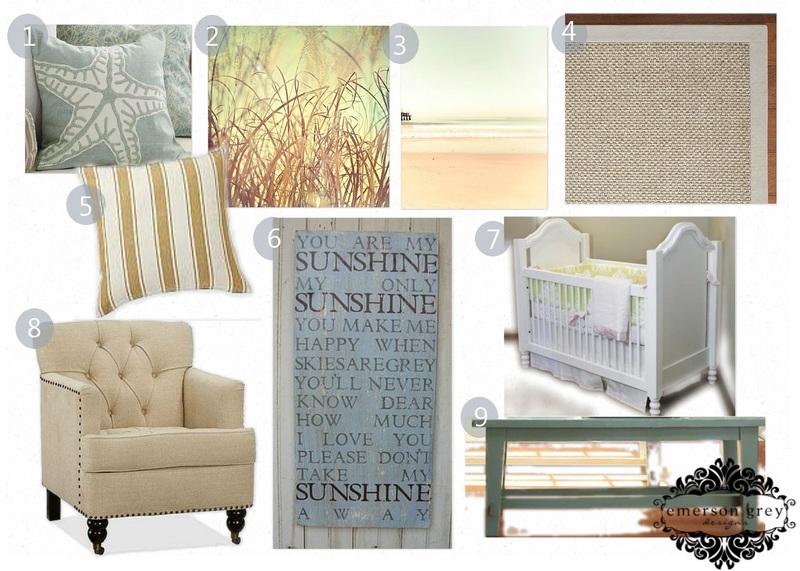 Inspired by Pottery Barn’s new catalog, I decided to design a beach themed board. Aren’t we all ready for consistant beautiful weather? I know I am. I used a good amount of products actually from the Pottery Barn catalog. I love the new Silver Topaz natural fiber rug, it’s such a pretty color. The starfish pillow is such a fun accent to pull in the theme without being overly themey. I am loving the images that I found on Etsy. You must visit these photographers shops and see all the other beautiful images they have captured. And who doesn’t love “You are my Sunshine”? So, are you ready for a visit to the beach? Love it, Bri! What a calming and beautiful oasis for a baby!